Crawley Limo is probably the best-loved limousine hire company in Sussex. We adore special occasions and do everything to ensure you have the perfect outing, whether it's a wedding, christening, hen night or a fabulous picnic. You can rely on us to make your day superb. Feel the luxury. Our chauffeur-driven cars are top notch. We want you to have a luxurious trip to remember when you hire a limousine from us. Our chauffeurs are hand-picked, experienced drivers who really care about your special day. We take your occasion seriously but love to see you having fun! We guarantee you'll have a wonderful outing with our chauffeur-driven limousines. We know that you've planned a big day and you don't want to stress over your transport. So we always arrive ahead of time to ensure peace of mind and a wonderful experience. You can rely on the best limousine service in the Crawley area. Your special occasion is our passion. Whether you want a luxury limo for your school prom or to hire a limousine for a smart party or an anniversary, we want to make sure that you have a first-class experience. We do everything to make sure that Crawley Limos provide the perfect event for you. It makes no difference whether you book our wedding limo service or a fun day out, we'll still take care of you like royalty! Crawley Limos will help you to choose the perfect limousine, then add all the finishing touches you require. We understand that hiring a limousine is special – it’s not something you do every day. So it has to be right, exactly what you want. We believe you should have the perfect experience. It's why Sussex and Surrey folk choose us above other limo hire companies. You may know exactly what you want or you may have just a vague idea that you want to hire a limo but no inkling of exactly what is available. So we're here to give you all the advice and help you need. Pick up the phone now and check out our limo service on 01293 344600. You can smell the quality when you hire a limousine from Crawley Limo! We know that you want a special car for your occasion, so our cars are just that. Each vehicle is chosen by us to offer you a great experience. You can't fake quality and our limousines are simply the best. Our spotless Crawley limousines are so smart and shiny you can see your whole body - not just your face! Beautifully clean inside and out. With inclement weather a feature of our UK climate, we hire limos that have been regularly cleaned and polished, just waiting for you to enjoy. We'll do you proud with the best and shiniest limos in the South of England. We may not be the cheapest limo hire company, but we believe we offer the best value chauffeur-driven cars in Crawley and West Sussex. Our quality shines through. We love our limos. When you love something the way we love our limousines, you take pride in everything you do. That sums up Crawley Limos perfectly. Every bride wants to be a Princess on her wedding day. And there's nothing that will make her feel more special than travelling in a beautiful limousine. Most of us only hire a limo on very rare occasions. So we want to be pampered and looked after. Given the best and most luxurious experience. And that's what you'll get with Crawley Limos. We love to pamper our brides and help their day start with magic. Proms are such a big thing these days. 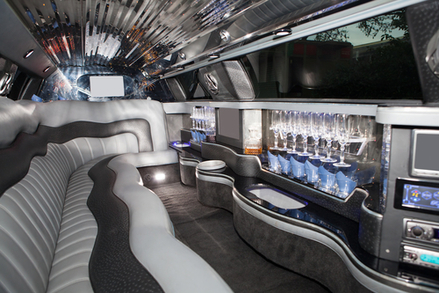 It's wonderful to have a year-end party and what better way to arrive than in a fabulous limousine from Crawley Limos. We know what a special occasion this is and we'll make sure you're taken care of and delivered to your prom in style. You can share your ride with your best friends and you'll be the envy of those who are chauffeured by Mum and Dad! Don't do things by half, share a cool limo for your prom. Next to the wedding itself, one of the really fun things for the girls is the hen night. It's a time when you want to be out with your mates celebrating your life-changing event. So why not do it in style? Hire a limousine to chauffeur you all to your hen do. You can rent a limo that suits your budget and the size you require and share the cost. The price of hiring a limo may be less than you think! Call us now to find out . These days the traditional stag night has often turned into a stag weekend or even a stag week or stag holiday! However you're going to celebrate your stag do, you can add more than a touch of style by hiring an awesome limo. Whether you want a shared limo drive to the airport for your overseas trip, or simply a night to remember, we can help. Whether you want to celebrate a birthday in style or travel in a luxury limo to a posh picnic or a day at the races, we can make your day perfect. Get your free quote now by calling us on 01293 344600 or fill in the form for a quote and we'll get back to you quickly. You're on the way to creating some magic memories! We often find that people want to hire a limo from Crawley to Brighton for a special night out. Or maybe you'd like a luxury shopping trip or a visit to a London theatre. We can cater for your requirements. Check out our mate's Crawley and Horsham Fencing website for fence repairs and replacement. "The Best Luxury Limousines for Every Occasion"
Crawley Limo works with the best Limousine Hire companies in the area to bring you the best experience possible for your special occasion.